It’s midnight, and it’s 44 degrees below — yes, below — zero. Celsius, Farenheit, it doesn’t matter; the scales meet at 40 below. At this temperature, silence is noisy. Snow squeaks, trees moan, ice creaks. I’m lying on frozen tundra swathed in layers of down, wool, and high-tech fabrics, cursing the cold. Then a glimmer of green races overhead, chased by a whirl of white echoed in rose. At 2 a.m., I’m still gazing skyward, mesmerized by these ethereal streaks dancing across the night sky. Most people visit Churchill, Manitoba, to see polar bears. Some come to kayak or snorkel with beluga whales. I’ve come to view the Northern Lights. This tiny town, sited where the Churchill River flows into Hudson Bay, is one of the best places to watch nature’s fireworks. Statistically, March is one of the best months for seeing Northern Lights, or Aurora Borealis. That’s when Frontiers North offers its small-group tours to this outpost of civilization 1,100 miles north of Winnipeg. The program covers everything from the science behind the phenomenon to Aboriginal arts and lifestyles, tips from a photographer about shooting the lights to tips from a musher about driving a dogsled. The tour, which begins and ends in Winnipeg, includes three nights of lights viewing this natural cirque du soleil via tundra buggy. The weeklong adventure isn’t just a trip to see the lights; it’s a cultural immersion. I fall in love with quirky Churchill by day, but it’s the night sky that steals my soul. 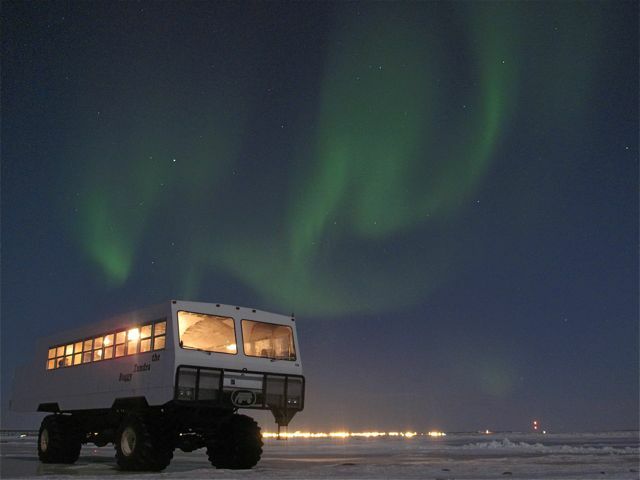 We bump across the frozen Churchill River estuary and into the tundra-covered wilderness edging it in a purpose-designed tundra buggy tricked out with comfy couches and a stove. Our group is fortunate; we score three nights of clear, albeit cold, weather. Bundled against the bitterness, I gaze spellbound as green, rose, and white streaks dance amid the stars. My spirit shimmies, swirls, and waltzes with them, as they trip the light fantastic against the silent symphony of a sub-Artic night. Tags: Churchill, Frontiers North, Northern Lights. Bookmark the permalink.